Around a year ago, Marc Pasternack joined the Wallsauce designer collection with some of his unique artwork. 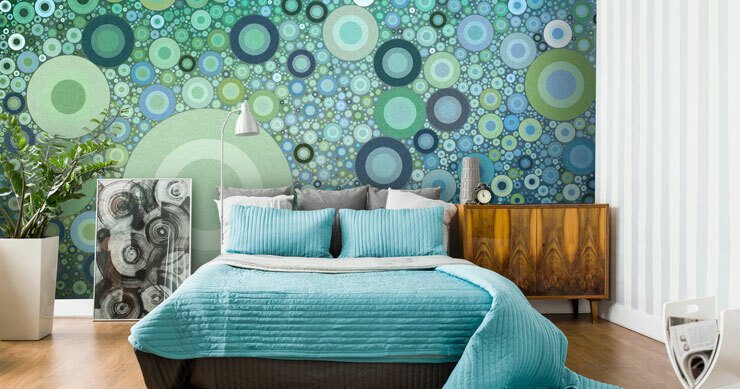 Not only are his wall murals bringing vibrancy and statement to your walls, but they are also bringing a story. Read our conversation with Marc to discover how his artwork came about on an enlightening trip to Northern India and how his life experiences can help you live a better life. Your artworks have an interesting story behind them. Could you tell us a little bit about how they came to be? I had an opportunity to spend 6 weeks at Sherabling, a Buddhist monastery in Northern India. It was the perfect time to be there. My life seemed to be in freefall and I was taking a good look at some of the qualities I wanted to improve within myself. For the previous couple of years, I’d been going to energy/light channelling workshops and I believe wholeheartedly that ‘where attention goes, energy flows’. So, every day I would focus on a different quality. At the same time, I had started to woo a woman (I hardly knew) from afar. The only place where there was wifi was a long walk away which gave me ample opportunity to dwell on each quality. En route to the hotspot, I would pass stupas (large buildings which housed prayer wheels). These prayer wheels are like huge oil drums, painted with Tibetan calligraphy and Buddhist icons and inside were thousands of mantras, handwritten by the monks. As a ‘finale’ to my focusing on each quality, I would turn the prayer wheel in the customary fashion, giving one last prayer to invite that quality into my life. I would then spin the prayer wheel one last time and take a close up, deliberately capturing blurred photos of the prayer wheel in motion. As well as actively wanting to improve these qualities within myself, I was keen to discover whether it was possible to capture the essence of that quality on camera, whether there was a discernible difference between, say, a photo where I’d been focusing on ‘gratitude’ and one where I’d been focusing on ’surrender’. I had never set out to create an art project. When I got back home to the UK, I promptly forgot about these photos. A couple of years later, I stumbled across this collection of images and felt drawn to do something with them. I started playing around with them on my computer, eventually manipulating them into the images that turned into the collection ’43 intentions’. I LOVE the fact that each piece is literally imbued with the quality that gives the piece its title. Without meaning to, it has turned out to be one of the most interesting and creative projects that I’ve worked on. You can read more about the process and see all 43 pieces on my website. What is your favourite piece from your ’43 Intentions’ collection and why? My 'favourite' changes fairly often. I always have some pieces hanging in my bedroom but I change them around, depending on which qualities I feel drawn to. At the moment, I have Fulfilment, Willpower and Integrity hanging. They serve as a reminder when I wake up and I like to think that the energy and intention that was imbued into each piece gently radiates into (and influences) my space. Can you tell us about your choice of bold colours and shapes used in your art? The colours were determined by the photos that I manipulated of the spinning prayer wheels. The manipulation involves the use of circles. Each circle uses an algorithm that shows the predominant colour in that area of the underlying photo. I was especially into circles at that time. Whilst at the monastery, I came across one of Buddhism’s central concepts ‘Sunyata’ which is mostly (mis)described as 'emptiness' or 'the void’. It has many meanings depending on which kind of Buddhism you follow, but in my understanding of it, it contains both nothing'ness’ but which, since everything is impermanent, also has an inherent quality of 'limitless possibility’. This is just one small part of its meaning. It is a very complex concept that describes the true nature of reality. Sunyata has an accompanying symbol, which is a hand-drawn, incomplete circle (similar to the zen symbol for Enso). I was pretty preoccupied with the concept and symbol whilst there… and started noticing incomplete circles everywhere. I love all kinds of art and photography and go to exhibitions frequently. Gustav Klimt, Yayoi Kusama, Roy Lichtenstein, Andreas Gursky, Gerhardt Richter, Damien Hirst, Peter Blake, Mark Rothko all spring to mind, although I’m inspired by just about everyone, including my own children! Where do you see the murals being installed? Is there a specific one that you think belongs in a specific room? I don’t feel there is any specific reason for any piece to be in any specific room. However, what I've noticed is that people are drawn to the pieces in several ways. On one level, if people don’t know the background story, they are attracted by the colour schemes and shapes. Once they know the story, they are attracted by the quality or ‘intention' that is imbued into each piece. Very often, both the colours AND the intention are equally as attractive! What would it mean to you to see your artwork take up an entire wall in someone’s home or workplace? I can honestly say that I will never tire of this. On one level, there is the fact that your work has connected with some stranger so much so that they want to have it in their home. That causes a very powerful reaction in me. I am humbled and grateful. It means that I am more able to make a living doing something that I love. On another level, I hope that these pieces, which have helped me to ‘heal’ and grow, provide the same benefit for the people who have adorned their homes with them. 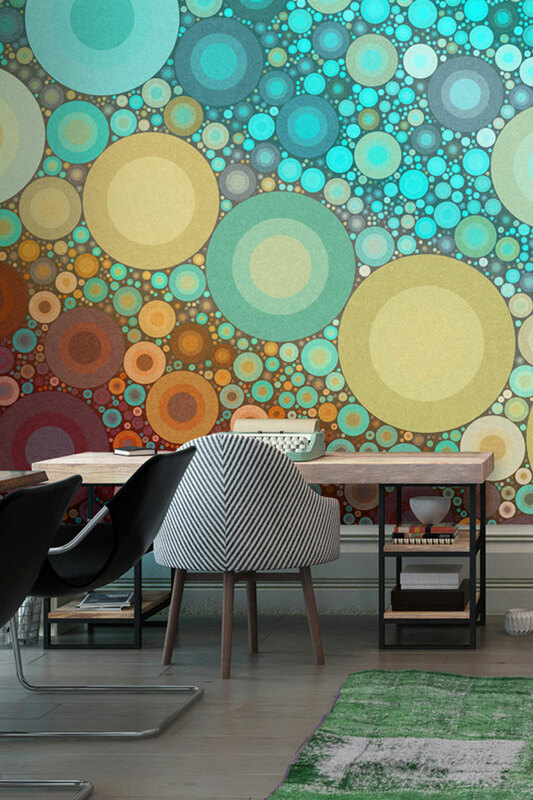 When I produced the artworks, I thought they were beautiful and interesting, but as wallpaper, they have been taken to a totally different level. I love that. Do you have any advice for people who feel their life is in a freefall? I believe that we live in an age where a large proportion of the population struggles to cope. We are bombarded with information and our attention is constantly being drawn in all directions, particularly towards our mobile devices and social media. I can only speak about what has worked for me. Being at the monastery, where there was virtually no wifi, was a game changer for me. Removing these distractions provided the opportunity and space to look within. Silence was golden and a rare luxury for anyone who lives in a city. If you’re lost and dissatisfied with your life, it suggests that the way you’re doing things almost certainly needs to change. If you continue doing things the way you do them, nothing will change. If you want to make changes, you need to live with more awareness of what you’re doing and how and why. You need to recognise your habits, behaviours and their patterns. Fear holds us back and most of the things we fear are totally unfounded and never arise. I spent a year or so actively doing things that made me feel uncomfortable and fearful including auditioning for a singing part in an immersive theatre production as well as going on various challenging workshops. Conquering your fears is liberating. Meditation is another great way to observe yourself and create change. Fortunately for me, I have the guidance of a good woman. The woman I was wooing when this collection came about. She is a yoga teacher and yoga has become a major instrument for change with me. So much so, that my partner and I now run a yoga retreat company ‘Om&Nom’. She teaches yoga and I cook. We have brought our collective wisdom from our own experiences and strive to help people to find a greater happiness. 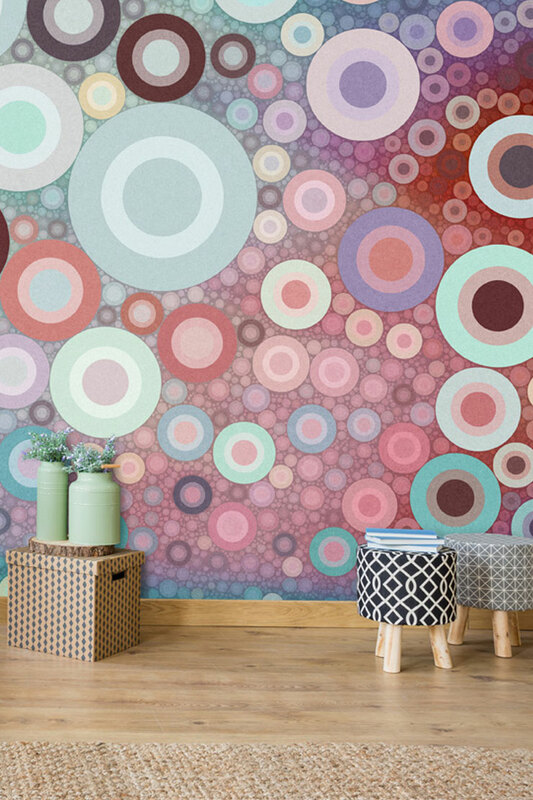 If you’d like to transform your walls with one Marc’s masterpieces, you can head to his mural collection. Alternately, we’d love to hear your thoughts on the collection in the comments box below.